A Massachusetts man was sentenced to 17 years for a plan to attack the Pentagon with remote-controlled model planes. WHDH's Christa Delcamp reports. BOSTON - A Massachusetts man was sentenced to 17 years in prison on Thursday for a plot to attack the Pentagon and the U.S. Capitol building in Washington with explosives loaded into remote-control model airplanes. Rezwan Ferdaus, who was arrested in September 2011 and pleaded guilty in July to terrorism-related charges in a deal with prosecutors, told the court he had devoted a lot of time to self-reflection while in jail awaiting sentencing and that he accepted his fate. The 26-year-old was arrested after an FBI sting operation in which he requested and took delivery of plastic explosives, three grenades and six assault rifles from undercover FBI agents who he believed were members of the al-Qaida network. Ferdaus, a Muslim who has a physics degree from Northeastern University, delivered a long, soft-spoken statement in which he offered no apology for his actions but thanked his family and friends for supporting him. He spoke of "a world filled with injustices," but also said "no dehumanization can serve as justification for inhumanity in other places." The 17-year sentence, which also includes 10 years of supervised release, was the result of a July plea agreement worked out between his attorneys and prosecutors. Ferdaus pleaded guilty to charges of attempting to destroy and damage a federal building and attempting to provide material support to terrorists. Prosecutors dropped four other counts that could have raised the total possible sentence to 35 years. Before approving the sentence, Stearns told Ferdaus that he was impressed by his self-reflection. 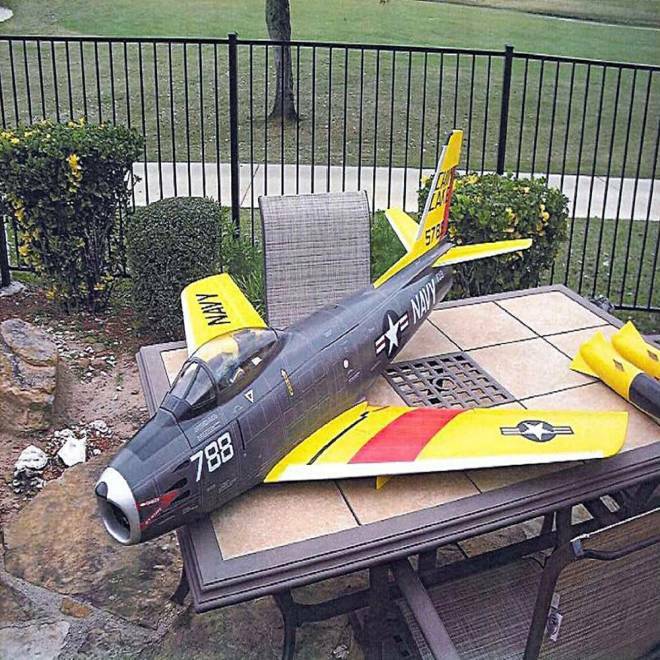 A remote-control model of a 1950s U.S. Navy Sabre jet fighter that prosecutors said belonged to Rezwan Ferdaus is seen in this undated photo released by the United States Attorney's Office District of Massachusetts. "You don't need any lecture from me. Your statement convinces me that you have the character and the capacity to search your own soul," Stearns said. "I'm going to leave it to you to finish that journey." In a letter to Judge Richard Stearns, Ferdaus' parents, Showket and Anamaria Ferdaus, said he slipped into a depression during his senior year at Northeastern, which led to mental illness that was "obviously visible" to his family since late 2009. They said they tried to get him to see a doctor but he would not. "We took a very cautious approach. After all, he was over 18 and we could not force him to see a doctor. That is the American way. We felt helpless," they wrote in their letter. Ferdaus' attorney, Miriam Conrad, told reporters after the hearing that her client had shown no interest in terrorism before FBI investigators approached him. "There was no evidence ever produced that Mr. Ferdaus sought out contact with any outside groups before the government became involved or even after the government became involved," Conrad said. Assistant U.S. Attorney Jack Pirozzolo disagreed. "He was a person who decided that he wanted to become a terrorist," Pirozzolo said, adding that before the FBI investigation began, Ferdaus had tried to obtain weapons illegally from an area gun shop and performed surveillance on a train station in his hometown of Ashland, Massachusetts. "Those events predated the undercover operation that unfolded here," Pirozzolo said. Ferdaus planned to carry out the attacks on the Pentagon, located in Arlington, Virginia, and the Capitol using a scale model of a U.S. Navy F-86 Saber fighter jet about the size of a picnic table, which he kept in a storage locker in suburban Boston, authorities said. Authorities said the public was never in danger from the explosives, which they said were always under the control of federal officials. The government had alleged that Ferdaus told undercover agents of his plans to commit acts of violence against the United States by "decapitating" its "military center" and killing "kafirs," an Arabic term meaning non-believers.